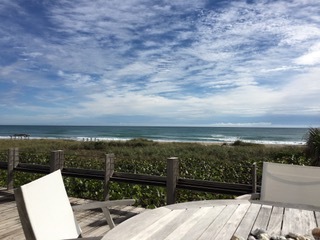 This is a picture of the beach on Jupiter Island. It is quiet all year round because it is private. People can't come here to visit because there is no parking on the streets and it is heavily patrolled by their own police force. This is the view from the deck of the cottage we stayed in a few years ago. Our friends own the cottage and were gracious enough to invite us to stay for a week. We enjoyed a very different pace of life there. New York has an energy all of its own. The beach life is nothing like this. Thank God for another pace! A slower pace is what we needed, especially my husband. He needs away time so he can clear his mind and not be concerned about his office or clients. He loves being an Attorney but the constant race of going to court then the office is waring on him. The apostle Paul reminds us of what life should be like, in regard to kindness. As you might remember from previous posts I have written, Paul wants the Ephesians to be compassionate. This is God's desire! All of us need time to think clearly and to put away our fleshly ways. Time restraints can play into our behavior. The quick pace and running around with busyness can cause us to be short with people and we might forget to be courteous. Ouch! Didn't I just do this on the phone with the tech in the doctor's office? Yes I did. I am caught in my own judgement! Oh well at least you know I'm human. There was a time I wouldn't get on the phone with a Dr. office because I was too shy. I think you know what I'm saying. It takes a concentrated effort to show God's love all the time. It is worth the effort because He gets the glory. Hallelujah!